"E.Kt. 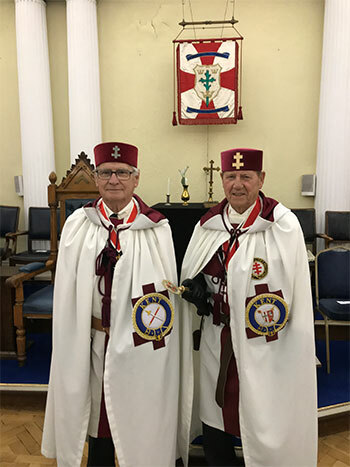 Eddie Senior with the Provincial Prior, R.E. Kt. David Jordan". Eminent Knight Eddie seems to have spent most of his life travelling. For the first twelve years of his working life he was a member of the Royal Air Force. Following which he worked with British Airways for ten years, most of which was spent living and working abroad, before leaving to manage his own tour operations company and retail travel agency. During his life he has visited 116 different countries, and by January, 2019, this will be 117, when he and his wife Susan will have completed their month long tour of Argentina. During his worldwide travelling, Eddie has taught, with his wife on a voluntary basis, in schools as diverse as a primary school in St Kitts; the Ubaldo Correia school, Santarem, Brazil, on the banks of the Amazon; in Chung Hua School No. 2 in Kuching, Sarawak, and the Phom Svay Primary school in Siem Reap, Cambodia. He joined the St. Michaels Preceptory, No. 436, in 2001, and immediately discovered that Knight Templar Order was the one he enjoyed the most. There he met another Freemason, Trevor Potter. Trevor had served as his Inner Guard, when Eddie was Worshipful Master of Frederick Wheeler Lodge in Croydon, Surrey. He was advised, by Trevor, that the most rewarding way to enjoy K.T. would be to joining the Provincial Prior’s Bodyguard. As that would be one of the ways he would be able to visit throughout the Province. To this date he has not stopped visiting. He has served three Provincial Priors, and gained Provincial rank, and still makes himself available to the Bodyguard should they need a last minute substitute. He was installed in the St. Michael’s Preceptory No 436 on 3rd July 2001, Preceptor on 1st July 2008, currently Guard. Joined the Kent Bodyguard Preceptory No 552 on 5th October 2005. Currently 2nd Constable. Joined the Frederick Friday Preceptory No 484 on 1st September 2018. He has also joined the Thanet Preceptory No 401 on the 4th October 2018 and was immediately appointed as First Herald. In the meantime, after being asked to accompany R.E.Kt. Peter McIntyre on a Provincial visit to South Wales, he found the real travelling bug, and has now visited nearly all the Provinces in the country for their annual meetings. The only Provinces left to visit are Cheshire and North Wales, Lancashire and Bristol. We wish him good luck on his quest.